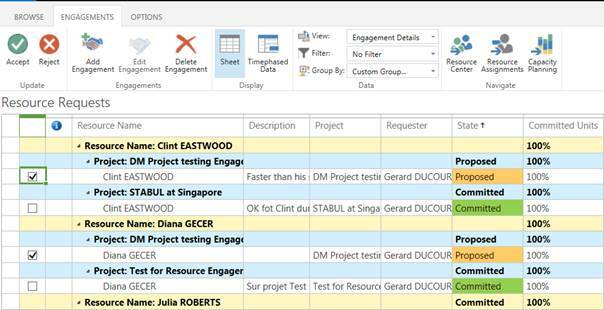 Assign some of these resources in Project Pro Gantt chart. Then publish the project and wait several minutes. “Some of the assignments for this task are not fully covered by engagements”. Right Click on the yellow icon in Gantt Chart. The message changes: “There is a proposed engagement that would cover this assignment. Someone needs to approve this resquest in order for this assignment to be compliant”. Do the same for the other assignments. In the Resources ribbon, Click on the Resource Requests button (on the very right). NB: The task assignment is not displayed in this view. The two new Committed Engagements are marked with a light green color. Rejected Engagements turn to the same light green color, but we cannot Edit them anymore, and they don’t have any Committed Work. Figure 2: No conflicts here! In PWA, in the TASK ribbon of the Schedule page of the project, Click on the Resource Plan button. In Project Pro, we arrive in the Resource Plan view. 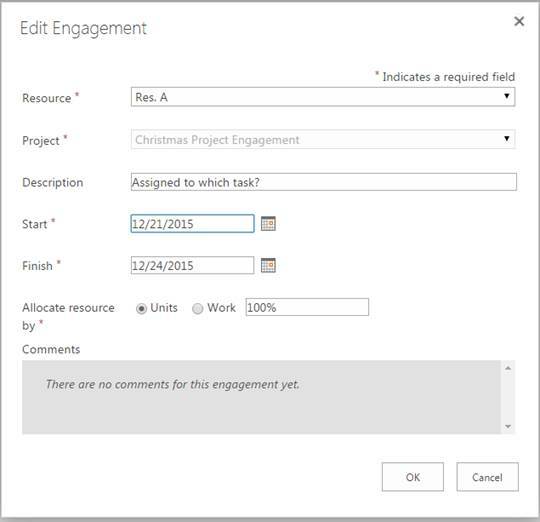 In the Resource Plan view, the Project Manager can check the Engagement status: Proposed or Committed or Rejected. Different Engagement Status with colors of the Resource Requests view in PWA. 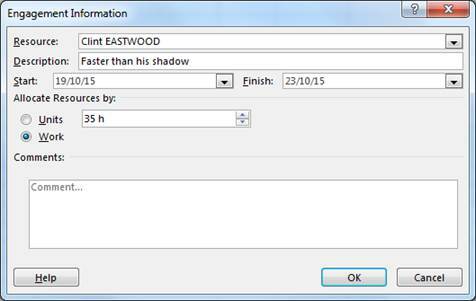 Select an Assignment, in italic. Does it implie the RBS? We do not have a field that will map a resource manager to a resource. It is possible for multiple resource managers to be able to manage requests for the same resource. If you are in SharePoint permission mode, anyone with the “Resource Manager” role will be able to view all requests and can filter out which resources they want to see requests for in the resource center page before clicking through to the resource requests page. For the first release we did not add a new field for resource manager but it is something we can consider for the future if enough customers find it necessary. In the Resource Requests view of PWA, it is possible to create an Engagement completely independent from any assignment. Click the Add Engagement button in the Engagements ribbon. “New resources have been committed to your project”. You can select a Resource which will be the default one for the future Engagement. 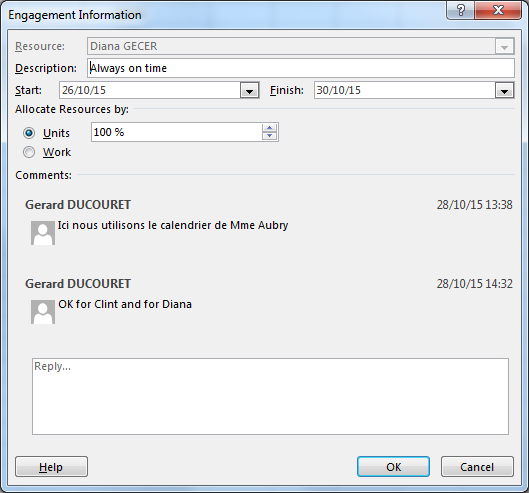 By default, this Engagement Request appears as Committed, but the Resource Manager can Reject this Engagement. In the pop-up menu, select View in Task Usage. We select one Expert Métier (SME): Richard GERE. The way you can do this is when you start on the Resource Center page, select the generic resource plus any named resources you might want to swap them out for, then click on the “Resource Request” button in the ribbon. The resource drop down in this view is filtered to all resources that were selected in Resource Center so this should show you everyone you selected on the previous page. 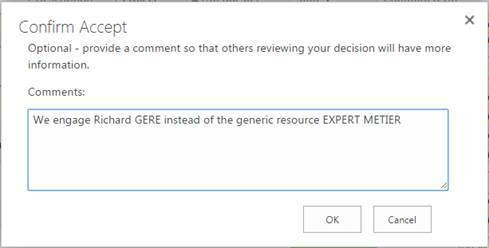 In the Resource Name field, there is a drop-down list which allows the selection of another resource, especially a named resource. Note: “This resource was added to the project because a new engagement was created and approved by a Resource Manager”. 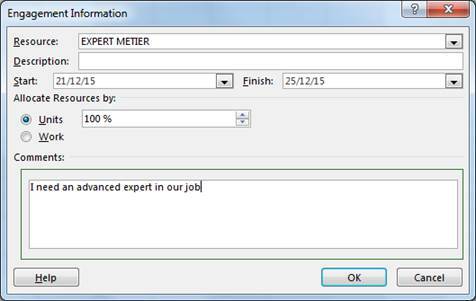 In the Resource Sheet, EXPERT METIER is still there, but a new resource has been added: Richard GERE. “This resource was added to the project because a new engagement was created and approved by a Resource Manager”. When all the discrepancies between the new “proposal” and the “Committed” data about Max units and about Duration, Dates…, all the yellow icons disappear. In the project “Engagement overallocated”, there is an Engagement that has been accepted while it was in conflict with a previous existing engagement for the same resource in another project. Warming up for the MVP summit…..we have a couple of teams that are reviewing the resource engagement with their customers, and one of them gave me some pretty good feedback yesterday. Figured I’d share it in advance of our sessions this week. Note that some of these may indicate a lack of support material rather than functionality. 1) Once rejected, the RM cannot modify the engagement again, i.e. to un-reject it. Recommend including that as a use case. 2) We used to be able to get the engagement to show up in “Draft” mode, but that seems to have gone away with an update to the desktop client. Is there something we are missing? 4) Resource Request view (MPP) does not display FTE units, however, the Resource Capacity (PWA) does. It would seem that these should be displaying the same information in the same format? 5) Deleting an Engagement Request removes all historical Engagement Request data. Can we at least include a confirmation dialog on delete? 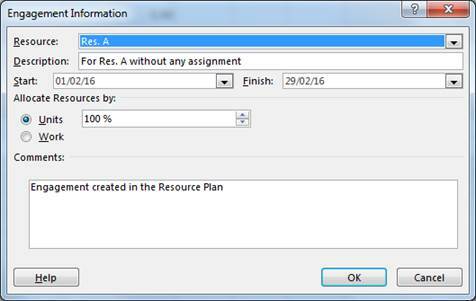 6) Deleting resource from the Resource Plan removes the resource from the project and all assignments including actuals. There is a confirmation if there are actuals, however, there is no confirmation if there are not actuals. There really should be a confirmation whether or not there are actuals. 7) Consider the following scenario: A PM requests a developer. The RM responds by reassigning the engagement to two named developers. The PM is then challenged to figure out which approved requests correspond to the original request for developer. It would be good if there was a unique ID that allowed us to map the approved engagements with the original request.